Dr. Seuss’ The Lorax is one of the greatest children’s books ever written, for it doesn’t pander to its young audience. 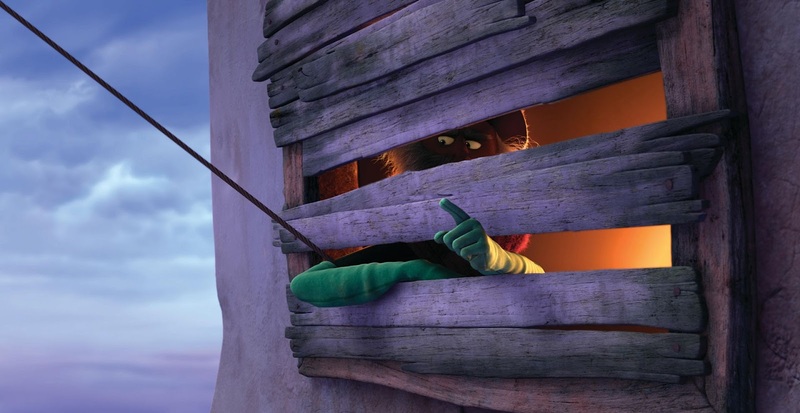 It is a sad, uncompromisingly bleak story of a world desolated by greed, and though it is not an overly complex work, Seuss refrains from reducing morality to simple black-and-white. He refrains from his usual whimsy and humor so that the story itself may carry as much weight as possible, and as a child, the book had a tremendous impact on me. It was the first time I’d ever considered that we have a responsibility to this planet, that the resources we consume are finite and precious. As I’ve grown older, my esteem for the book has only grown. At any age, it is a masterful piece of artistry. Universal’s “The Lorax” is one of the worst children’s films ever made, for it ignores or mocks everything that mattered to Dr. Seuss. Instead of a serious, down-to-earth fable, it is a broad, pandering comedy, filled wall-to-wall with terrible jokes, endless slapstick, pop culture references, horrifyingly awful musical numbers, and long, complicated car chases. Yes, you read that right. 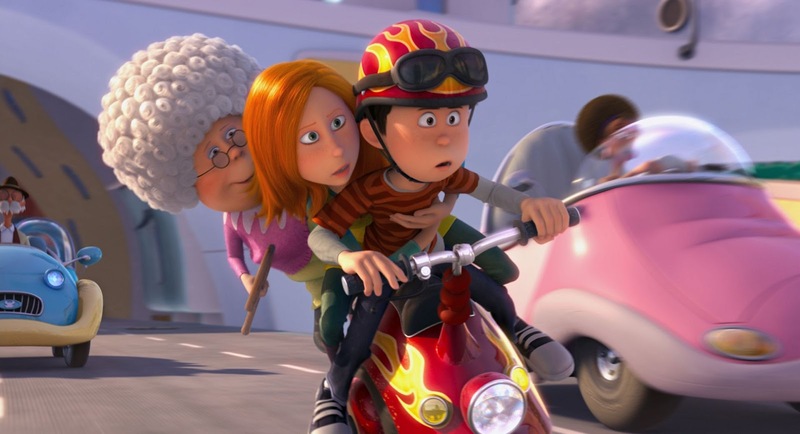 “The Lorax” now includes car chases. Several of them. 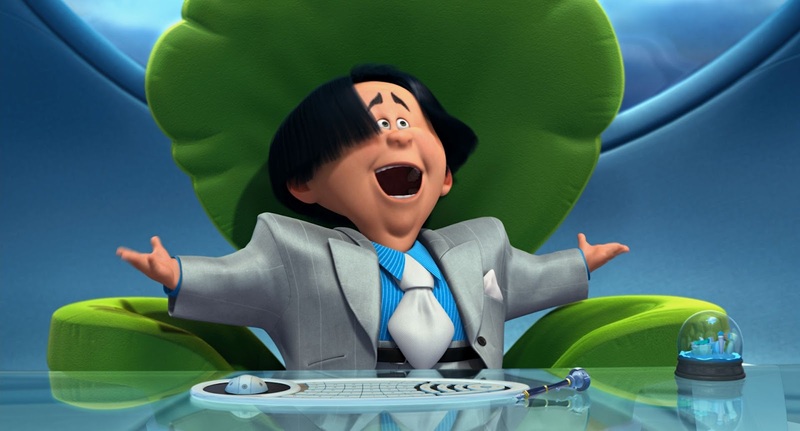 The Lorax himself is no longer a dignified, reverential figure, but a pathetic piece of comic relief we are made to laugh at. The Once-ler isn’t a somber, single-minded businessman, but a buffoon with an electric guitar. There are singing fish, dancing bears, and a ridiculously over-the-top villain whose evil plan is plagiarized from “Spaceballs.” The few moments in the film that directly reference the book make fun of or parody what Seuss wrote, and most depressingly of all, the environmental message is buried deep, deep down until the film’s final minutes, when a highly simplified version of it is delivered with all the effectiveness and sincerity of an eighties public service announcement. Before I get too deep into what is sure to be a spectacularly angry rant, I should note that I do respect the difficulties in adapting Seuss to the big screen. 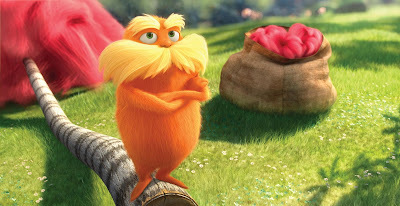 I understand that changes and embellishments need to be made, and I don’t think that’s inherently a bad thing; I’m in no way opposed to the idea of a feature-length “Lorax” movie, and as a critic, I’m willing to stomach most alterations so long as they respect the basic tenants of what Dr. Seuss wrote. This film, however, is blatantly disrespectful, or at the very least ignorant, and it’s apparent right from the beginning. The book, as you may remember, begins with a young boy travelling through an apocalyptic wasteland where he finds the mysterious, shadowy Once-ler, who tells him how the land was destroyed. In the film, the boy is named Ted, and he no longer lives in an apocalyptic wasteland. He lives in Thneedville, a city made entirely of plastic and concrete, and this is the first big flaw in the adaptation. Humanity has learned to adapt, and they’re perfectly happy with the artificial city they’ve created for themselves. There’s no urgency, no danger, and no need for anyone, including Ted, to learn what happened to this world. Instead, Ted seeks out the Once-ler because he wants to impress the beautiful girl next door, Audrey, who dreams of seeing a real tree. Let me sum that up for you: Seuss wrote a story about a boy living in destruction who seeks out knowledge to set the world right. Universal has made a film about a boy living in luxury who seeks out knowledge so he can get laid. It goes completely against the point of the book. Seuss’ framing device was his way of showing how our actions in the present could impact generations to come; it’s the proverbial “child paying for the sins of the father.” The film steamrolls through all that subtext by giving the kid an utterly selfish motivation, and to make matters worse, the film is far more focused on Ted and the plastic city of Thneedville than on the actual story of the Lorax. As in the book, the conflict between the Lorax, voice of the trees, and the Once-ler, who chops down trees to make his popular Thneed products, is told through flashback, but the filmmakers treat this fable not as the focal point of the story, but as an annoying distraction that keeps them from animating car chases back in the present. Whenever the Once-ler’s story starts getting interesting, we cut back to the present, Ted says something snarky, goes back home, and gets in some zany misadventure before coming back to hear the next part of the tale. It’s an incredibly frustrating structure, but not as infuriating as the Once-ler’s story itself. Like most everything in the movie, the tale is played almost entirely for laughs. 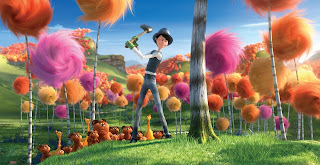 There’s a little bit of discussion here and there about the morality of the Once-ler’s tree-chopping, but for the most part, it’s just a bunch of cute animals prancing around performing slapstick while the Once-ler plays electric guitar and short jokes are made about the Lorax. 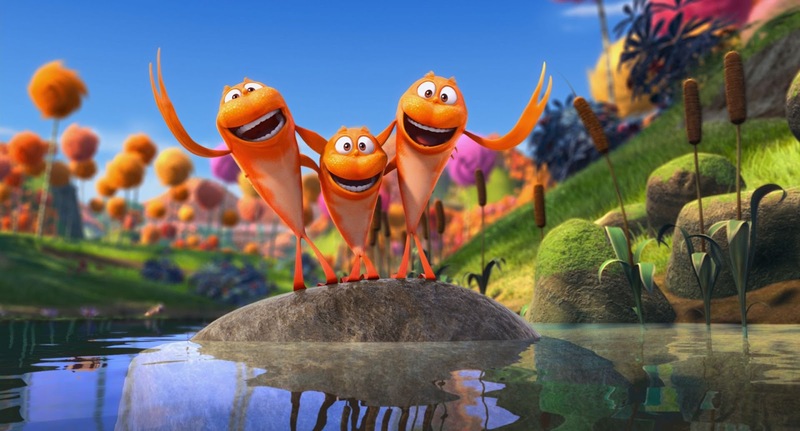 In one sequence, an obnoxious group of singing fish perform the “Mission: Impossible” theme while the Lorax and bear pals throw a sleeping Once-ler and his bed into the river. Just like Dr. Seuss wanted. The biggest sting, for me at least, is how the filmmakers handle the actual deforestation scenes. The Once-ler’s steady depletion of the land’s resources is the focus of the book, and Seuss’s verse and imagery are so painfully precise that the reader feels visceral agony at the death of every tree. It’s actually hard to get through, because Seuss makes the trees and environment into real characters; their deaths mean something, and that’s where the book derives its power. In the film, however, all of that is depicted in one electric-guitar song sequence; we don’t even see that many trees being chopped down. Before the Once-ler starts singing, the forest is in pristine shape, and when he’s done, it’s all gone. The journey from point-A to point-B isn’t just glossed over, it’s entirely ignored in favor of putting the Once-ler in a goofy outfit and giving him a bunch of embarrassing dance moves for the kids to laugh at. No part of the Lorax story is more important than this, and the film reduces it to a cheap, petty, utterly substance-free musical number. That’s all finished only an hour into the film, of course, so that the last thirty minutes can be devoted to an incredibly long car chase. As much as I disagree with the creative decisions made during the flashback sequences, they are at least tangentially related to the book. The material with Ted and Thneedville, though? Oh. God. It isn’t just disrespectful to Dr. Seuss. It isn’t just a stain on the fabric of filmmaking. It is an affront to art itself. Protagonists don’t come any more boring than Ted, Audrey is a type, not a real character, and Ted’s elderly grandmother is a badass daredevil with a penchant for snowboarding and, you guessed it, car chases. But I can handle all that, I think. Their material is shockingly unfunny and intellectually offensive, but it’s not nearly as bad as the new antagonist created for the film, Mr. O’Hare, a short, pissy entrepreneur who controls the town by selling them clean air. When I joked about the film plagiarizing “Spaceballs,” I wasn’t kidding. O’Hare’s entire evil empire is stolen from the “Perri-air” gag in the Mel Brooks classic. That’s not what makes him a terrible character, of course; no, he’s insufferable because he’s exactly the type of villain Seuss avoided in the book: two-dimensional, black-and-white, over-the-top, moustache-twirling cartoon bad guy, with an incredibly annoying voice to boot. Not one second of the present-day material rings true, or is anything less than chronically insufferable. I suppose I should mention the voice acting, which is almost entirely dreadful. I don’t really have specific criticisms for any individual performer, though; like all non-Pixar American animation these days, the voices were cast based on celebrity, not merit, and for the most part, the performances simply don’t match the characters. Zac Efron’s work as Ted is oppressively lazy, Ed Helms has no idea what to do with the Once-ler, and Rob Riggle can’t make anything out of the O’Hare character. The only exception is Danny DeVito as the Lorax; I didn’t expect his voice would fit, but in those precious few moments when the film calms down enough to let him actually inhabit the character, he’s perfect for the part, and clearly has a lot of passion for the material. The only positive thing I can say about the film is that the animation is stupendous; it’s lush, gorgeous, immaculately detailed, and beautifully colored. 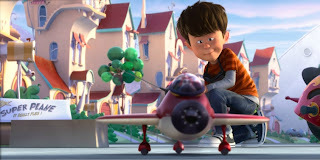 It is a flawless CGI representation of Seuss’s artwork, much like the studio’s “Horton Hears a Who” adaptation, and on that purely technical level, “The Lorax” is a triumph, thus the “plus” in my F+ rating. In every other regard, the movie is an utter failure, and the worst part may be that today, March 2nd, the film’s release date, is the good Doctor’s birthday. When I was in Elementary school, we celebrated this occasion each and every year by going from classroom to classroom, where each teacher would read us their favorite Seuss book. It was a meaningful and fun way to honor his legacy. 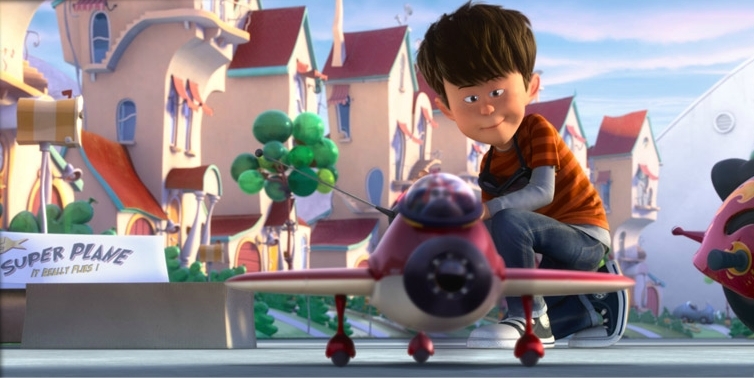 Today, though, kids across America will be treated to a loud, obnoxious, soulless piece of filmmaking that desecrates everything that Dr. Seuss and The Lorax stood for. I, for one, am not okay with that. If you are a parent looking to entertain your child, please, don’t succumb to paying for “The Lorax.” Read them the book; rent the animated TV special; if you must go to the theatre, see a positive piece of family entertainment, like “The Secret World of Arrietty.” But whatever you do, please don’t expose your children to this empty corporate shell of a movie. They won’t learn anything meaningful about the environment. The most substantive message they can possibly take away from the film is “oh-look-at-the-furry-bears-and-bright-colors,” and in my opinion, kids deserve better than that. If there was one thing we know Dr. Seuss believed in, it was that children are worthy of the best. Ignoring all its other sins, “The Lorax” film violates that crucial principle, and that alone makes it an abject failure in my book. This review was made possible by a generous donation from Mr. Steve Oelrich.